Trinkets to Treasures; 30th annual resale event, presented by the Junior League of Collin County, features gently enjoyed items that are collected from Junior League of Collin County members and business throughout the community to be recycled as “treasures” for shoppers. Merchandise spans 22,000 square feet and includes a variety of new and gently used merchandise including adult and children’s clothing, home and office furniture, appliances, collectibles, home electronics, toys, sports equipment, and more. 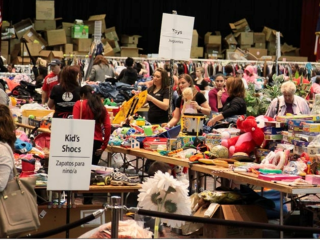 This is Collin County’s largest one-day resale event that serves as one of the major fundraisers for the Junior League of Collin County’s community impact initiatives. Trinkets to Treasures is organized and staffed exclusively by Junior League of Collin County’s provisional new member class of 125 volunteers who invest more than 2,500 hours to organize the sale. All proceeds benefit community impact programs of the Junior League of Collin County. A unique aspect of Trinkets to Treasures is the opportunity for nonprofit partners to receive shopping cards valued at $25 each and free admission for four. These shopping cards are passed along to the nonprofits’ clients in need. More than 600 shopping cards are distributed each year due to the generous donations by the community. TICKET INFO: $5; free for children 12 and under.